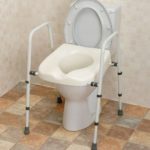 Shower commode chairs are designed to make showering easier for the less mobile and elderly people who suffer from incontinence problems, and are available as either static or wheeled models. The dual-purpose shower commode chair allows the user to sit down safely whilst both showering or toileting, and is an essential aid to help with your personal care, and maintain your independence and well-being. There are many models and styles available, from fixed static chairs to ones with wheels to be pushed, or even self propel ones. Also, some come with armrests, footrests, backrest support, or even a tilt-in-space option. We have reviewed and tested many different commode chairs to bring you the best shower commode chair. Gives you have a safe and comfortable washing experience. It is easy to manouvre in tight spaces. The hinged armrests make it easier to transfer on and off it. The drop down plastic footrest ensures safer transfers and comfortable foot support when transporting and bathing. The plastic coated material used on the commode chair is peel resistant. The commode chair is a little on the heavy side. Width between Arms – 535mm (21″). Height from floor to top of commode seat – 500mm (19¾”). Seat Size – 420 x 420mm (17 x 17″). Aperture – 330 x 220mm (13 x 8½”). Overall width – 640mm (25″). Overall Depth – 520mm (20½”). Overall Depth (with Footrest) – 830mm (32½”). Seat to Footrest – Lowest Position: 355mm (14″) / Highest Position: 430mm (17″). 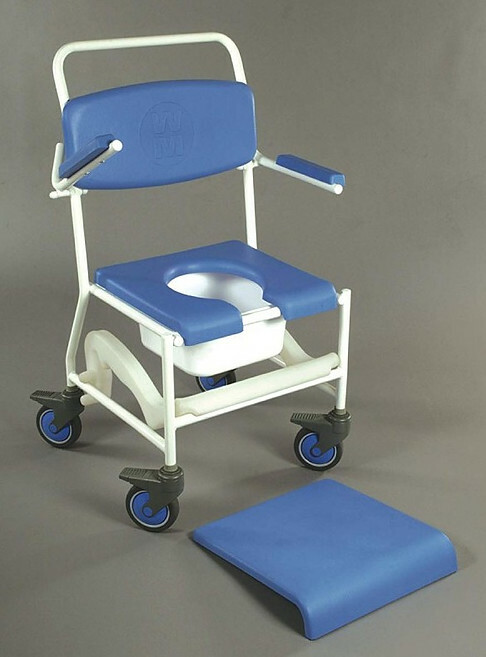 This Mobile Shower Commode Chair is ideal for reducing the number of transfers and eliminates the need for separate items in the shower and toilet. It will give you a safe and comfortable showering experience. 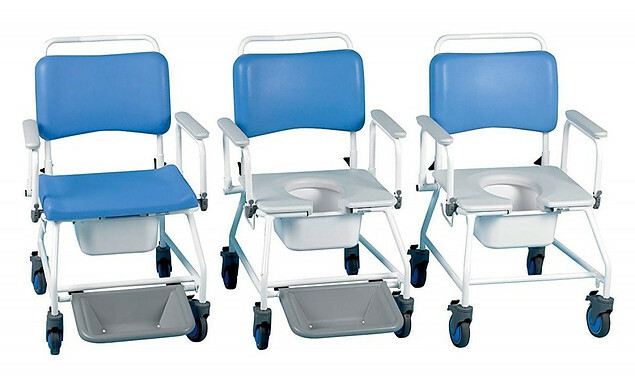 Take a closer look at the NRS Healthcare Mobile Shower Commode Chair and see what you think. Award-winning design bathing aid that is also an international bestseller. Has removeable armrests and footrests that slides quickly and easily underneath the seat when not in use. Has four lockable castor wheels. Chair seat is fully open to the rear. Has powder coated steel push handle. The Etac clean shower chair has no holes or welded seams to catch your fingers or hand on. They also reduce the risk of the chair corroding increasing the life of it. The cut away rear section of the chair makes it easier for you to manage your personal hygiene, whether that is you or the carer. Simple durable design that will last for many uses. The footrest slides quickly and easily underneath the seat, to allow easier access for the user and to make transfers easier and safer for everyone. The armrests can either be swung away or fully removed which makes transferring on and off the chair easier and safer. The Etac Clean Shower Commode Chair is an award-winning design bathing aid, that is also an international bestseller. Comfortable and supportive arm supports that make it easier to get on and off the chair. 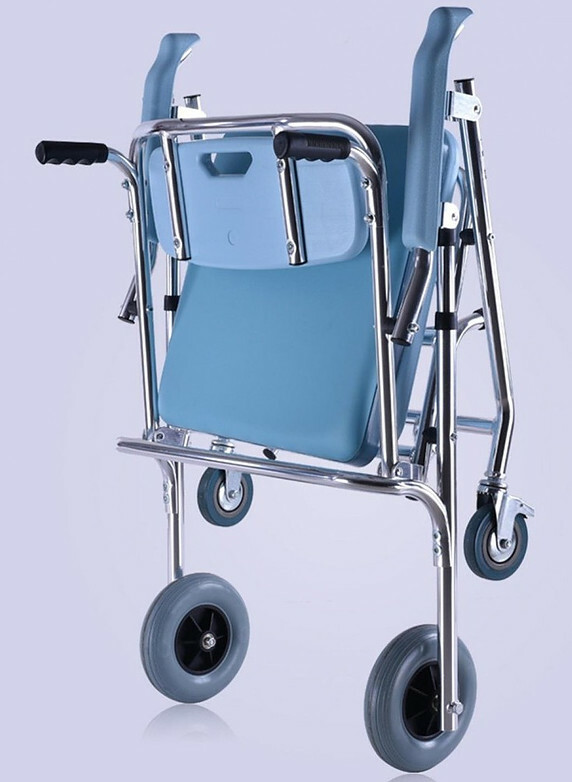 The lockable castor wheels ensure that the commode chair is fixed when in use, and the high quality wheels give you great manoeuvrability. This height adjustable Etac Clean Wheeled Shower Commode Chair is an exceptional bathing aid for both the elderly and disabled users. This award-winning design chair is both durable and comfortable, and is an essential aid to assist you with all your personal care. 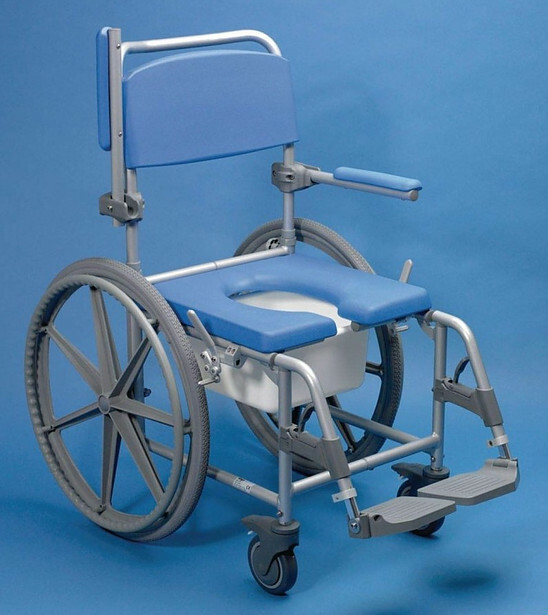 Take a look at the Etac Clean Height Adjustable Shower Commode Chair and see for yourself. Available in 2 width seats: The two different width seats means that it is able to accommodate a wider variety of users. Easier personal cleaning: The front cut out on the seat makes it a lot easier to manage your personal care. Multi-functional armrests: You are able to either drop the arms down, swing them back, or completely remove from the chair, which helps with side transfers. Detachable parts: The chair has a removable clip on seat, back and armrests to help with your hygiene control. Additional toilet roll holder: Unlike some other commode chairs, the toilet roll holder allows you to manage your personal care wherever you are. Ideal for bariatric user: The shower commode chair has a maximum user weight of 35 Stones. 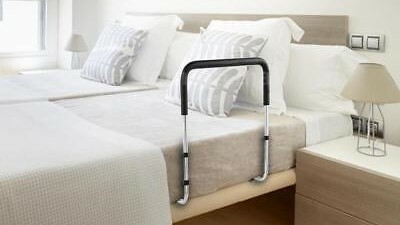 Good manoeuvrability: The lockable castor wheels ensure safe and easy transport from room to room. This 2 in 1 shower chair and commode ensures you are able to manage both your personal care ans showering safely. Take a closer look at the Homecraft Atlantic Bariatric Commode Shower Chair and see for yourself. Easy to manouvre: The lightweight frame makes it easy for you to manouvre the shower commode wheelchair from room to room. Both self propelling and attendant propelled: The wheel chair design allows you to either self propel or can also be pushed by an attendant. 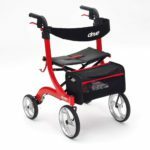 Added security: The brakes on the front wheels help keep you safe and still when the chair is not moving and in use. More space bathing: When showering or using the commode chair, the footrests can easily be removed to give you more space and make it more comfortable for you when sat in the chair. Easier side transfers: As the armrests can be flipped backwards it makes getting on and off the chair sideways a lot easier. More compact: The detachable back makes the chair more compact for storage. Easier personal cleaning: The front cut out aperture on the seat makes it easier to manage your personal care. The chair feels quite upright and might not appeal to everyone. This deluxe shower commode wheelchair is both lightweight, easy to manouvre and comfortable to use. Take a look at the Days Deluxe Self Propelled Wheeled Shower Commode Chair and find out for yourself. 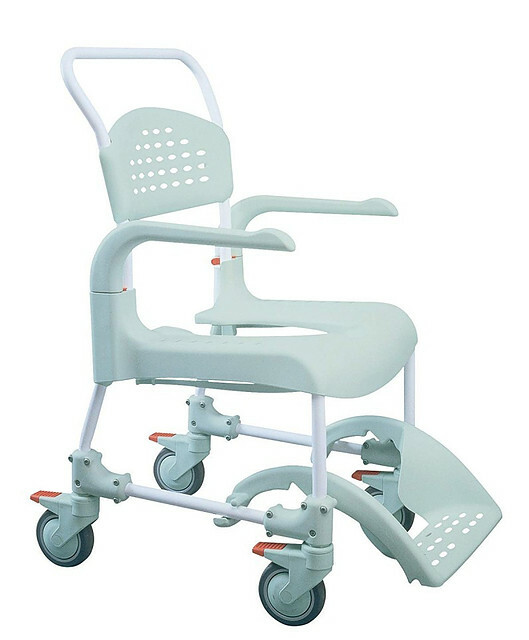 Portable: If you are looking for a lightweight foldable shower commode chair then this is ideal. The one button operation is easy to manage and the chair can be stored away when not in use, or easily transported. Non slip ergonomic hand grips: The hand grips are comfortable, supportive and easy to clean. Large portable bucket: The bucket has two handles making it easier to carry and can be removed either from the top or the front of the chair. Foldaway footrest: The footrest can be used either as support when you are sat on the chair, or as a supportive step to help you get on and off. In addition, the foot support can be folded away when it is not needed. Strong rear castor brakes: The rear wheels have strong galvanised plate brakes which can be rotated 360 degrees. This allows the chair to be turned easily in small spaces when you are trying to put into position. High maximum user weight: This foldable shower commode chair can accommodate a maximum user weight of 200Kg. Comfortable seat: The chair has a soft leather cushion board cover. The only downside to this foldable chair is that the arms are fixed, so you are not able to transfer on and off it at the side, unlike some other shower commode chairs. 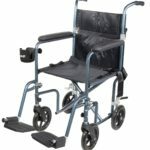 This lightweight foldaway wheeled 2 in 1 shower chair and commode is perfect for easy storage when not in use or transportation. 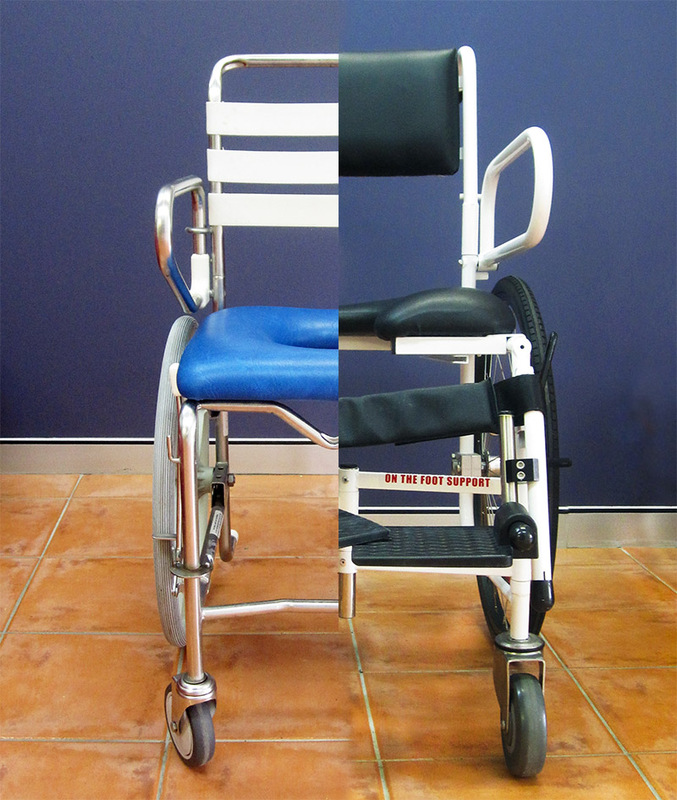 Take a look at the SHKD Folding Wheeled Shower Commode Chair and see what you think. Unique tilt manoeuvring: The tilt operation can be done from the side, which gives you the ergonomic position to work from. In addition, it helps enables good eye contact and communication between user and carer or family member. Smooth tilt operation: The gas pistons ensure that the chair is tilted smoothly and also returned to an upright position. They also lessen the risk of carers of family members injuring themselves when operating the tilt in space facility. Comfortable head support: The adjustable headrest support ensures that your neck and head is adequately supported at all times and you are in a comfortable position when attending to your personal care. Adjustable seat height: The 5″ seat height adjuster ensures that regardless of your height you are always sat in the optimum sitting position, where your legs are in a neutral position and your back is well supported. Adjustable heel straps: This helps prevent the user’s feet from slipping backwards. The shower and commode chair may be a little on the large size unless you have a large wet room or shower area. For those looking for a high quality versatile multi-functional tilt in space shower commode chair, then this is for you. Take a look at the ETAC Swift Mobile Tilt 135 Shower Commode Chair and see for yourself. Adjustable seat height: The seat height adjuster ensures that regardless of your height you are always sat in the optimum sitting position, where your legs are in a neutral position and your back is well supported. Easy to transfer on and off: The flip up armrests make it easy, even in small spaces, to get safely on and off the chair. Non slip footrests: The textured pattern on the footrests ensures that your feet won’t slip off them even when it is wet. Easy to manouvre: The 4 small swivel castor wheels turn easily even in tight spaces. Wheel locking mechanism: The 5″ castor wheels have a locking mechanism so the chair will not move when you are attending to your personal care. Washable backrest: The fabric back support can be easily removed and cleaned ensuring good hygiene control for you. Comfortable back support: The tension straps allow you to control how taut you want the fabric back support, which ensures that you are comfortable. Optimal positioning over the toilet: The space-saving push bar ensures that you are positioned in the right spot when using the toilet. Some people may need more space between the armrests and backrest posts for comfort when sat in the chair. The Aquatec Ocean standard shower commode chair offers a lot for your money and is one of the best attendant propelled shower commode chairs available. Take a closer look at the Invacare Aquatec Ocean Standard Shower Commode Chair and see for yourself. 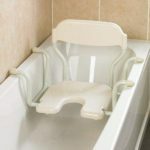 A shower commode chair is a safe way to manage both your showering or toileting, and is an essential aid to help with your personal care, and maintain your independence and well-being. Many people struggle to manage their personal care, often without knowing that there is equipment available to help them. 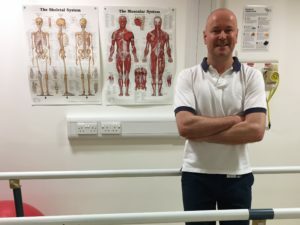 Trying to shower or use a conventional toilet can be challenging for those with reduced strength, balance, co-ordination and other co-morbidities, putting you at increased risk of falls. If you have long standing mobility problems, then a shower commode chair is a perfect mobility aid to increase your independence. If you are recovering from an injury or illness, and are unable to walk to the bathroom, then a shower commode chair gives you back your independence to manage your personal care needs safely. The chairs are either self-propelled or attendant operated so depending on your circumstances, but both help maintain your dignity to perform these daily activities. Personal hygiene is so important to prevent cross contamination and infection happening. A shower commode chair is made of durable moulded parts that are easy to remove and clean. Many of the chairs have stainless steel frames that withstand modern cleaning methods. They also have covered castor wheels that help prevent debris collection. Many people require a shower chair, toilet surround and commode to assist them with their toileting and personal care. However, for those who have limited space, and on a tight money budget, then the all-in-one shower commode chair is a much better option. 1. Self-propelled or Attendant propelled ? Are you planning to use the shower commode chair on your own ? If yes, do you have enough upper body strength and range of movement in your arms and hands to self propel the chair on your own. Although many chairs are lightweight to manouvre on their own, you may also need to consider your exercise tolerance. Do you soon fatigue of become short of breath quickly ? How far do you need to manouvre the chair to and from the bathroom ? 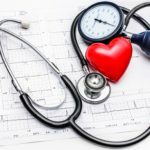 Are you planning to manage your personal care on your own ? 2. How much space do you have ? Space is a big issue. You need to make sure that you have sufficient access in and out of rooms with your shower commode chair. Do you have enough room in your bathroom / shower area to manouvre the chair ? 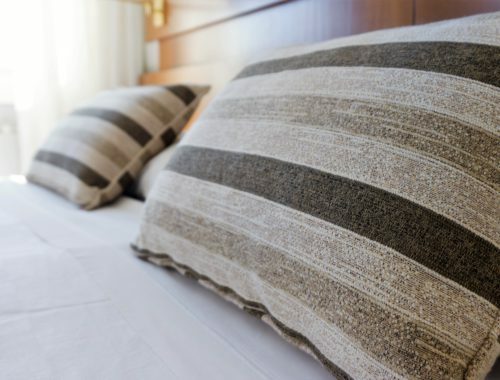 Consider your turning area – can you easily get access to things you may need whilst in the shower / toilet area ? 3. Tilt in Space or Foldaway ? If you have more complex mobility needs then you may need a tilt in space chair. The tilt in space option provides a versatile bathing and toileting solution, however once in use they can take up more room. All tilt-in-space chairs require the use of footplates and head or neck rests. 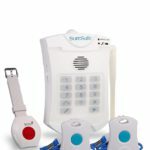 If you are looking for more information then AskSARA is an award-winning online self-help guide providing expert advice and information on products, and equipment for older and disabled adults and children. 1. Always ensure that the chair is in good working order, and that all moving parts are securely fastened before using. 2. Check for any screws or fasteners on the chair which may be sharp and could potentially cut you when in use. 3. Always ensure that the brakes are on before sitting or standing from the commode chair, and always re-apply the brakes after moving the chair. 4. Always make sure that the shower commode chair is cleaned after use, to ensure good hygiene control, and avoid the risk of cross-contamination or infections occurring. Hopefully the above guide will help you decide which shower commode chair is for you. 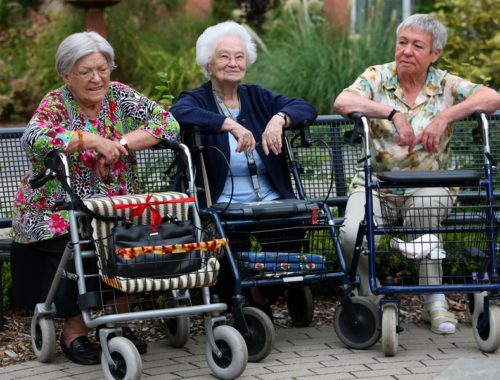 If you need any further advice, or information when choosing a chair, please contact me at mark@elderlydfallsprevention.com and I will gladly try to help you.